Last week I felt decidedly short-changed, almost a month after quitting smoking. Instead of being the picture of radiant health I was more ill than I ever remember being. It started with a tummy pain between my navel and breast bone. I thought that I would get better, but I didn’t. Our 10th wedding anniversary was far from romantic. I could not properly enjoy the eclairs which Cliff made, and spent a lot of time groaning and whimpering. At first I thought that I had a tummy bug, but had no other symptoms. No nausea, no diarrhea, just a constant burning pain, sometimes it escalated, and sometimes it subsided to a dull bruised feeling. Some nights were nightmarish yielding minimal sleep. While the pain didn’t increase while eating, I went off the idea of food. 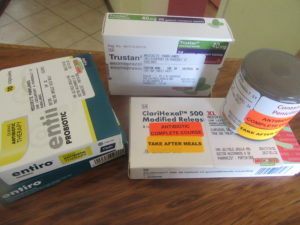 On day 6, after loosing 3 kg and a hellish night, I gave in and went to the doctor. He diagnosed gastritis (what a harmless sounding word). He prescribed Motilium (for the dyspepsia), which I took for 3 days and Trustan (an antacid), for 10 days. On the first day I started feeling better and within 36 hours all pain was gone. In Sept 2016 gastritis struck again. This time, knowing the symptoms I thought that I could self medicate and it would go away. That was the worst thing I could have done. Lesson learned go to the doctor immediately! First over a few weeks I made my way through 3 bottles of Gaviscon. Then my son Heath told me that he was prescribed Lancap for his gastritis he was prescribed 30 mg but you can get 15 mg over the counter and just double up the dose. It took me 2 months to go to the doctor, that is really really stupid. The doctor prescribed Trustan 40 mg which I took and it was controlling the symptoms but possibly because I left it so long the symptoms remained on the back burner, flaring now and then. At the same time I tried to control my diet eliminating alcohol, white bread, coffee, curry, sugar, tea, citrus once again I quit smoking as my new years resolution (hope it lasts this time). I must add that I am not 100% diligent with this, the moment I have a good day I sneak something prohibited in, or even when I’m having some discomfort. Last week I was prescribed an anti-biotic for a mouth abscess. Strangely the last 2 days of the anti-biotic I had no tummy pain at all. Immediately I started being naughty, on Friday alone I had a cupcake, a few sweets, 2 slices of toast with Nutella (chocolate is also a bad guy) and a glass of wine. On Sunday I had 1 beer, a slice of cheesecake and peri-peri chicken. On Sunday afternoon I was in agony and on Monday morning (today 23/1/17) I was back at the doctor. This is no joke, I have suffered for 4 months now. Today the doctor prescribed ClariHexal 500 XL (anti biotic), Betamox 500 mg (anti biotic), Entiro (probiotic) and more Trustan 40 mg. I’m going to keep a daily record of how I feel and what I eat as I understand that diet plays a big role. 25/1/17 – Today my tummy did not hurt much and the pain under my ribs was less intense. Tonight however I’m very bloated and uncomfortable. Today was Cliff’s birthday so I did have a few foods which I probably should have avoided. Food today, yoghurt, spanspek, 2 bananas, 50 g almond and cranberries, 2 rye crackerbread with butter and marmite, chicken casserole with sour cream and mushrooms, rice, tarte tatin (apple tart with puff pastry) and cream. 26/1/17 – Pain during the day was very little, just a vague bruised feeling. During the night tummy pain was intense. Food – Yoghurt with chopped banana, ryevita with peanut butter, peach, banana, granadilla, chicken pie, beetroot, roast carrots and sweet potato, cabbage, chocolate mousse with cream. 29/1/17 – Feel the same as yesterday, minimal pain but uncomfortable with no appetite. Not going to detail food, similar to previous days, no obvious triggers. 6/2/17 – At last I feel that I am getting better, no burning pain for a few days and now only on Trustan. 26/2/17 – I made a big mistake, yesterday morning after feeling pretty good for a while I had a cup of coffee, I did not suffer any pain as a result. Tonight I had a glass of orange juice, that was a HORRID MISTAKE, within 2 hours my tummy was burning, I had pain through the night. 27/2/17 – Still some pain after the orange juice all day. Am glad you much better , and enjoyed your Anniversary celebration non the less. Well done on the 5 weeks. My doc would just tell me I am now far healthier and refused to agree that any medical condition I had was related to quitting. I am supposed to have a gastroscopy to check why the Nexium not working and see an ENT about my throat, but thought I would first change eating habits.